I asked Hino-san about Professor Layton during our last session, but I haven’t had a chance to talk about Ace Attorney before, so I’m really keen to talk about that today. What was the original inspiration for the series? Well, I’ve always liked mysteries, and I actually joined Capcom because I wanted to make detective games. Of course, I couldn’t start doing that as soon as I’d joined the company, so at first I worked under Shinji Mikami9 on a game called Dino Crisis10.9. Shinji Mikami: the former head of Capcom’s Production Studio Four. 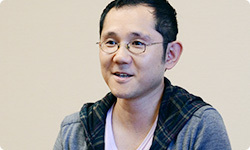 He worked as director or producer on several games in the Resident Evil series. He is currently CEO of Tango Gameworks.10. Dino Crisis: a series of survival horror games in which players do battle against dinosaurs. The first Dino Crisis title was released by Capcom in Europe in July 1999. A game from a completely different genre! That’s right! (laughs) After the second Dino Crisis title was released in 2000, Capcom set up an internal project in which they gave you a year to work on whatever you liked. It was aimed at developing the skills of younger staff members. “This is my chance!” I thought, and I started to think about the basic principles of my plan for Ace Attorney, something I’d just had on the back burner until then. Was that initial plan similar to the game we have today? Well, I’d started by thinking about an idea for the game system before anything else, but I think the basic plan was pretty viable. Specifically, since the style of previous detective games had been one in which the player selected an option in order to act – A, B or C – I wanted to create a new kind of interface for the procedure of making deductions and solving mysteries. Having the player select from a number of options is the style of classic adventure games, isn’t it? The kind that Yuji Horii11 used to make.11. 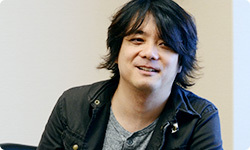 Yuji Horii: the creator of the Dragon Quest series and a game industry veteran whose career stretches back to the dawn of the Famicom (known as the Nintendo Entertainment System in Europe). Before working on Famicom titles he was also involved in several groundbreaking mystery adventure games that were released in Japan. That’s right. I really focused on how I could make the player’s deductions feel more tangible and intuitive. I thought that, if we could refine the “lie-spotting” concept, it would link much more naturally to the player’s deductions than the process of selecting from on-screen options. Right. Looking at what’s in front of them and noticing things that are out of place allows players to give more logical, pinpoint reactions. The rules are nice and clear as well. As a method of organising a deduction game, it’s actually exactly the same construction as the “option-selection” method: if there are three witness statements and five pieces of evidence, you have a total of 15 options to select from. It’s a system that’s clear, yet offers great depth, isn’t it? Yes. After the idea of that system became clear to me, I decided that the main character of the game should be a lawyer. I wondered if I could find something new, something other than a detective, and I thought that a game in which you played a lawyer, fighting cases in a courtroom, was something that hadn’t been done before. How did people react to that initial plan? Not very well! (laughs) When people heard words like “lawyer” and “courtroom”, they imagined something to do with legal matters, something heavy-going and difficult. I wrote my design documents during my summer holiday, and Mikami-san actually phoned my house to tell me to give up on the whole idea! I couldn’t believe it! I thought I was going to be praised for working during the summer holidays! (laughs) I think I channelled the shock of that phone call into writing the design documents. I needed to emphasise that having a legal theme didn’t necessarily mean the game would be stiff and formal, so instead I focused on the strong personalities of the characters and on the concept of finding inconsistencies in testimonies and discrediting pieces of evidence. Ah, it seems the backlash against Mikami-san’s phone call inspired the Ace Attorney game system! It certainly seems that way. I feel that phone call really helped to tighten Ace Attorney’s focus. You reacted positively to the criticisms and opposition of those around you because you wanted to make the game something they could enjoy. I think it could be said that Ace Attorney is the result of that desire. Yes. I just wanted to make it easy to understand. When it came to the game system, the initial idea was to let the player hear the whole trial, after which they’d be asked to uncover lies that people had said. We changed this so that the cross-examination was divided into themes, and once the player had cleared a section, they’d move on to the next. I thought that a game in which you identified inconsistencies in what someone had just said felt really good to play. As such, we broke the main story into a number of short sections, giving the player more opportunities to make deductions. I see. I suppose this is a great example of a time when opposing opinions aren’t a bad thing. In fact, this shows that such opinions can be useful when it comes to solving problems. I think it’s your ability to solve problems in ingenious ways that’s to thank for the fact that Ace Attorney games are often said to produce a “feel good” sensation in players. Was this something you were conscious of from the start? Was it something that you focused on when making the game? If I’m honest, I don’t think we were conscious of it. We only had a small team of seven people at the time, and I feel we were just trying to make something that we thought was fun. That’s where we got our energy from. From the start, we did think that we’d like to make something that could be played at a good tempo. 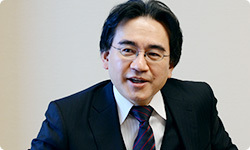 However, the tricks that game developers were able to employ on portable gaming devices to create that kind of tempo back then were just down to us deciding the right timing to generate sounds during gameplay, or the right intervals between which on-screen text would be presented to the players. In a way, the basic format of the Ace Attorney games was established as the result of our focusing upon these aspects when we were designing the original game. I feel that many games prioritise the game system to such an extent that it imposes restrictions on the stories they can tell. These games end up not being as much fun as they could be. How were you able to avoid having this happen with Ace Attorney? People said that was just too sudden, so I stuck the current first chapter in there to introduce the character properly, and lead the player into the second chapter. When the game was released, lots of people said it was a really shocking development! (laughs) I suppose it’s less expected when a character who’s just been carefully introduced is suddenly killed off. I hadn’t really calculated that it would work like that, so I was really surprised by people’s responses as well. So it wasn’t so much a case of steering clear from tried and tested methods, it was more that these methods never existed for you in the first place. And the rest was all down to talent, of course. It was the first time I’d written a story, so I didn’t really know any techniques or anything like that. After the game was released, I learned a lot from the opinions and reactions of the people who played it. I really felt that Phoenix and I were learning as we went along, getting more experienced together.